Make Your Event Unforgettable... When you want to make your event unforgettable, add the Magic of Michael Messing. Your guests will gasp in amazement as they witness miracles right in front of their eyes. They will laugh in delight at his comedy-oriented magic, and, best of all, Michael will keep them involved throughout his performance! It's an exciting and colorful magic show for all ages. 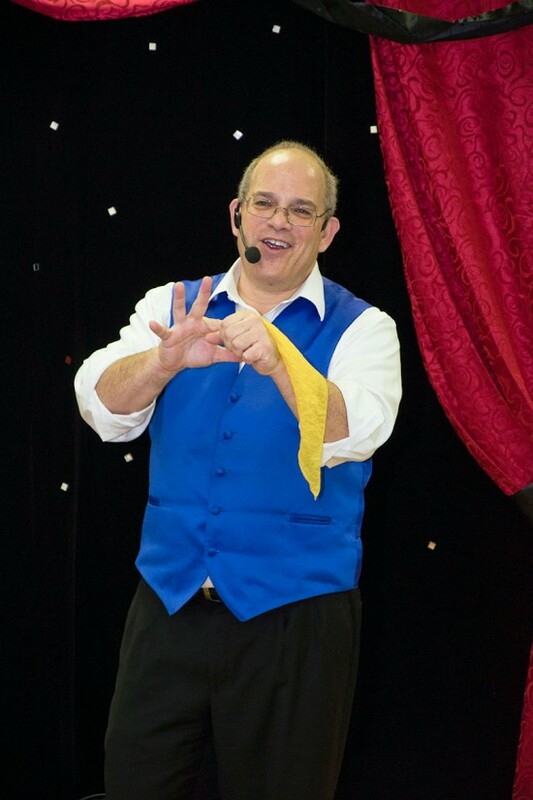 With 25 years of experience entertaining audiences, Michael Messing knows how to make a event fun and exciting. Don't miss out! Michael did a great job at our event! The kids loved his balloon art and his magic tricks! He brought good vibe to the party and kept the fun going throughout the day! I definitely recommend Michael! I was looking for entertainment for an upcoming corporate event and ran across Michael's profile. I am not going to lie, I was a little skeptical at first not knowing how the rest of my team would react, but I am glad I booked him. He was able to keep the group's attention through the magic show - and that is no easy task since they vary in age from early twenty's to mid- sixty's. After the short 30 minute magic show, Michael spent about an hour doing strolling magic for small groups. Everybody really seemed to enjoy the card and coin tricks and the one-on-one attention. Michael was very professional and accommodating to what would work best for our group and event. Thanks for a great event! Michael Messing was hired to provide strolling magic during our Black Friday event at College Square Mall and he did an excellent job. He brought smiles to the faces of our customers and added to the magic of the holiday season. We will definitely reach out to Michael again for future events. The kids absolutely enjoyed the show! The performance was wonderful! Thanks Michael for a wonderful show! It was a pleasure performing for your party! Nissan of Cookeville Christmas Party - "Christmas In Vegas!" I coordinated the Christmas party for Nissan of Cookeville with a Vegas themed party - we had casino games, showgirls, etc. - the only thing missing was a Magician. I found Michael Messing on Gig Salad and booked him for the event. His magic was on point and the guests loved him! He even had a trick where he pulled out a Nissan of Cookeville card in the deck. The client of course loved that. I would recommend Michael for any type of event where you need a Magician! He was on time, and worked until the end of his contracted time doing what he does best ....Magic! We live in Chattanooga, TN and Michael did an outstanding job performing at my 4 year old daughter's birthday party. The kids were mesmerized! He was able to keep all the kids, of all ages, focused and amazed. They were all so happy and my daughter continues to talk about his "magic". Made balloon animals for all the kid guests! If you're looking for a magician but unsure which one, choose Michael Messing. So professional, accessible, and just a great magician. Terrific magician! Great to work with! We hired Michael to perform at a family adult birthday party and he was wonderful. He was very responsive via email and I was able to book him quickly and efficiently. We communicated several times prior to the event to finalize arrangements and our address. The day of the event, he was right on time and his set-up and show were terrific. He had wonderful props and stage presence and everyone young and old loved his show. I would highly recommend Michael for any event. He personalized his show to all family members and made our birthday party celebration extra special. We had Michael do a show for my wife's birthday party. He was hilarious and fun to watch! Would definitely hire again! Michael has been a pleasure to work with! He came and did exactly what he said he was going to do and more! loved the atmosphere he created with the little kids. Would highly Recommend!! awesome set too! -For my 5 yr old twin girls. Michael Messing did a fantastic job at our son's party. The kids had so much fun! He was professional and knew exactly how to cater to every age. We had children there from age 2 to 7 and they all loved it! In fact, several of our friends are already looking to book him for their future parties! I would highly recommend hiring Michael for your next party! Fabulous & Professional Magician/Balloon Twister! We recently hired Michael for our son's 5th birthday party. Michael was professional from the very beginning with a detailed explanation of his show, different packages, etc. He was timely with a quick set up and break down and he kept the children completely engaged while paying special attention to the birthday boy. His show was entertaining for both children and adults and his balloon creations were spectacular! He had special treats for the birthday boy as well as something for all of the goody bags. For the money, Michael was a wonderful value and my husband and I received incredible feedback from our friends and family. We would highly recommend him for a personal or professional party. I would highly recommend Michael for your party or event. Michael is very professional and great with kids. His show is entertaining for both kids and adults. My nine year old daughter said it was the most awesome party ever!!! We booked Michael for our year old daughter's party. Everything went smoothly from booking to set up and take down. The kids loved the show. It was mass chaos until the show started and they were all quiet and amazed once he started his show. Michael performed a magic show and then a class to teach slight of hand tricks to my grandsons. His excellent professional skills as a magician were triumphed by his ability to assess the boys' personalities and know when and what to actively involve them. He instructed with patience, appropriate timing and humor. It was a pleasuren to watch Michael perform and my g-sons get totally hooked on magic! Michael Messing was amazing! The kids (and parents) were captivated by his show. He is a great performer/entertainer and made my son's birthday a hit! Kids are still talking about it! Michael performed for our twin's 6 year old birthday party and the kids LOVED the show. So did the adults! He was able to keep 20 children engaged and laughing for 40 minutes. His amazing talent with the balloon art was a bonus. The kids all went home so happy and my boys had a great birthday! I had Michael Messing preform at our granddaughter's 7th birthday party. The kids and adults loved it. The first time that I had seen 16 kids set still that long and would have set there even longer. I look forward to have him back to perform again at our other grandkids parties. We can’t say enough about what a terrific job Michael Messing did for us. We were lucky to book Michael for our daughter's seventh birthday. Everyone loved the party. Not only was the show amazing, the sound of laughter filled the playground. The show consumed my daughter, and she tried to figure out all the tricks. She has always been inspired by magic and now, a real magician performed for her. The parents enjoyed seeing the children happy. Michael's balance in attention to all children was impressive. His respect and love for the children showed. Michael was also very professional from the first phone conversation to the very end. We felt at ease when planning the party because we could tell that the show was going to be successful. Michael, thanks so very much for making Darya's birthday so memorable and for your generosity in giving all the children from the very youngest siblings to the oldest a treat bag which they all enjoyed. Tonight my daughter examined the gifts you gave her with twinkling eyes. I am very happy that she had the chance to have you at her birthday. It was so special. Insurance: $1,000,000 - I have a professional liability insurance policy. 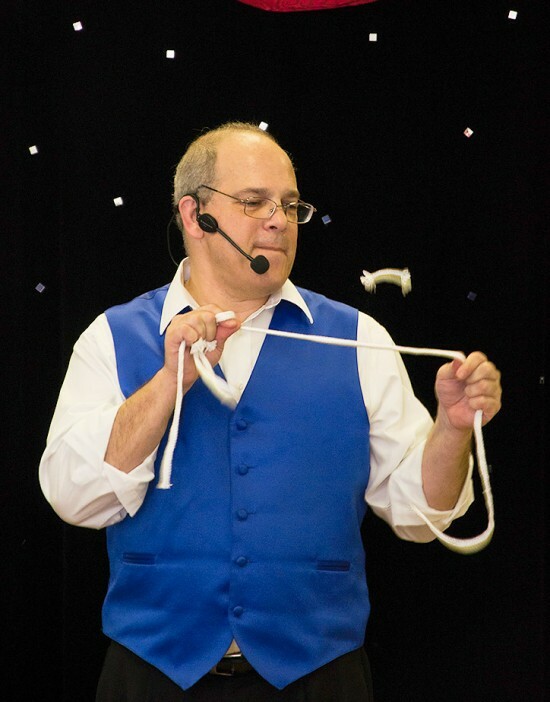 With more than 25 years as a full-time magician, Michael Messing has performed for cruise ships (Carnival Cruise Lines), festivals (Secret City, Foothills Fall Festival, The Festival of Reading), libraries (Knox County for 14 consecutive years and Claiborne County Library for 13 consecutive years), family events and children's birthday parties. Voted "Best Party Entertainer" by East Tennessee Parent Magazine, Michael will create a theatre in your home. Using music, comedy and audience involvement, your guests will be amazed and entertained. And it's all guaranteed! In addition to performing set shows, Michael does strolling magic and makes balloon animals. It's the perfect entertainment for picnics, festivals and social hours. A performance area is all I need. I have my own PA system, microphones, backdrop and lights.